You know, last semester one of my students came up to me and said, “Mrs. P, I’m gonna get a “B+” in your class this semester!” For him this was a big goal, as last year he scored mostly 73% and lower in his classes; I was so excited for him! He started out strong yet as the semester progressed, he slipped into old habits and ended up with similar scores as last year. I see this story far too often and created this goal setting process with him in mind. I want to see my students grow, progress, set goals, check in on their goals, and succeed according to their own standards! 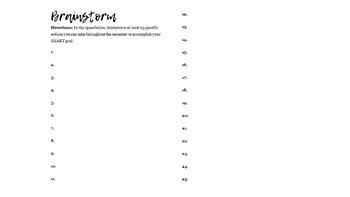 This resource is designed to aid them in this process. Though I use this resource in my sophomore World History class, it is appropriate for any secondary classroom. 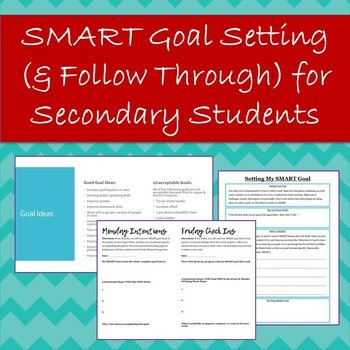 Students will learn everything they need to know about SMART (Specific, Measurable, Attainable, Realistic, and Timely) goals. They will brainstorm potential goals, narrow it down to one, and then make it SMART! 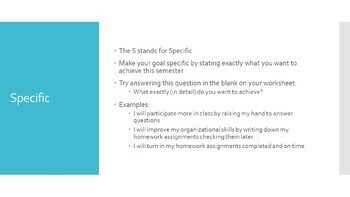 Then, students will brainstorm specific steps they can take throughout the semester to achieve their SMART goal. In their booklets, they will set Monday Intentions (steps to take throughout the week) and then reflect during Friday Check Ins. They will keep using this booklet throughout the entire semester. Directions are on a PowerPoint (editable) so you can walk them through the process. There’s also a slide about setting new goals in case some of your students achieve their goals early. 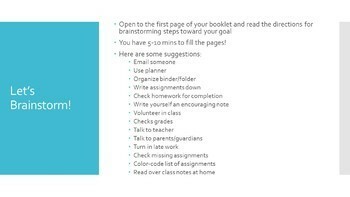 I can't wait to see what your students are able to accomplish this semester with this truly incredible goal setting resource! The opening activities will take about 15-20 minutes on the first day and then 10-15 minutes a week for the rest of the semester. For freebies, teaching tips, and more, sign up for my weekly newsletter and check out my blog! For more incredible Social Studies & Economics lessons, check out my store.